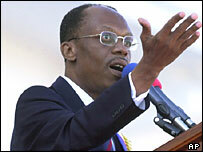 "When the full and true story of Jean-Bertrand Aristide is finally told, it will portray a noble and humble man who gave of himself honorably to serve the interests of all the people of Haiti. His only failure was his inability to overcome the brutal and corrupt power of the U.S. and its determination to see him fail. " "Cheap labor has always been at the heart of U.S. -Haitian relations, ever since the Haitian Revolution in 1804. It was actually a slave rebellion, the first and still the only successful one in modern history. The U.S. sided with French colonialism as the U.S. economy was based on slavery at the time and Haiti represented the first "dangerous example." US Campaign against Haiti: Why? "The armed insurrection which contributed to unseating President Aristide on February 29, 2004, was the result of a carefully staged military-intelligence operation. The rebel paramilitary army crossed the border from the Dominican Republic in early February. It constitutes a well armed, trained, and equipped paramilitary unit integrated by former members of FRAPH, the "plain clothes" death squadrons, involved in mass killings of civilians and political assassinations during the CIA-sponsored 1991 military coup, which led to the overthrow of the democratically elected government of Aristide. During the military government (1991-1994), FRAPH was (unofficially) under the jurisdiction of the Armed Forces. According to a 1996 U.N. Human Rights Commission report, FRAPH had been supported by the CIA." "The coup against Aristide ... must be understood not in isolation, but as the culmination of activities that really began the minute he was re-elected in 2000. Destabilization efforts by the U.S. government, active U.S. support for the creation of a so-called civil-society opposition, and eventually the invasion of Haiti by an armed band of criminals and murderers were all part of a process designed to ensure that Haiti would return fully to the fold of the U.S. empire and its minions in Haiti." The long-suffering people of Haiti suffered a catastrophic blow in February, 2004 when U.S. Marines kidnapped and deposed democratically elected President Jean-Bertrand Aristide. Why did the U.S. plan and carry out this act of savage banditry against a leader beloved by his people and last reelected in 2000 with 92% of the vote? It was because he cared about the 80% or more desperately poor and disadvantaged Haitians and was committed to improving their lives. He was determined to serve their interests rather than those of his dominant northern neighbor. That policy of any nation, especially less developed ones, is always unacceptable to the predatory neoliberal agenda of all U.S. administrations, the giant transnational corporations whose interests they serve, and in Haiti, their elite junior business partners. The Bush administration, in league with these dominant business interests, intends to return this nation of 8.5 million people, the poorest in the Americas, to its pre-Aristide status of virtual serfdom. To do it they destroyed Haiti's freedom and first ever democracy in its history and turned the country into a killing field."